For Ramzi Dudum, a third-year medical student at the George Washington University (GW) School of Medicine and Health Sciences (SMHS), opportunity came in the most unlikely of places: the barber shop. 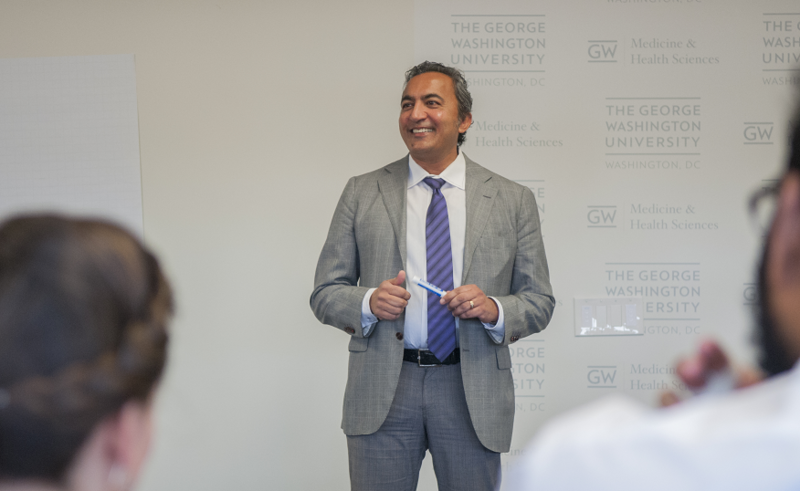 Dudum had earlier spent time on Capitol Hill, meeting representatives, including Congressman and physician Ami Bera, and learning about health policy as part of his Practice of Medicine III class. Dudum, a member of the SMHS Student Council, had such a positive experience visiting with Bera that he invited the politician to speak to medical students at GW. Dudum reintroduced himself to Bera, and in early April, the Congressman attended a lunch, where he spoke with a few dozen SMHS medical students about his life, his experiences, the role of government, and the new health care law. The barber shop encounter, Dudum said, was definitely an “only in Washington, D.C.” moment. It is precisely those moments that GW offers, thanks to the school’s proximity to Capitol Hill and the relationship between its students, residents, and political leaders. “This was the reason I chose GW: access to policy makers and the opportunity to work with a diverse patient population,” said Dannah Farah, a second-year medical student at SMHS and Bera lunch attendee. Farah, who plans to get involved in public policy and health, believes health care is a human right, a sentiment echoed at the lunch. Bera talked specifically about Maslow’s hierarchy, which theorizes that people’s basic needs – clothing, shelter, and food – must be met before they can reach their full potential, or self-actualization. The government, Bera explained, should play a role in ensuring that health care and education, as some of those essentials, are accessible. “It’s an interesting theory, in my mind, with the role of government potentially focusing in on the basest of needs,” Bera said. That theory, as the discussion went, is manifested in the new health care law legislation that has polarized Congress and led to significant discussion for students and residents eager to learn more about health policy. At the 15th Annual Health Policy Grand Rounds, for example, also held in early April, SMHS emergency medicine residents visited the Capitol to hear from a panel of speakers about the ACA and its implementation and legislative challenges. This year, the speakers included Jennifer Lee, M.D., former assistant professor of emergency medicine at SMHS; three physicians from think tanks, each representing a different point on the political spectrum; and Kate Goodrich, M.D., M.H.S., associate clinical professor of medicine at SMHS. Also on the Hill, Ken Harwood, Ph.D., PT, program director for health care quality, director for research for the Physical Therapy (DPT) program, and associate professor of clinical research and leadership at SMHS, served as a panelist during a May congressional briefing on The Nurse and Health Care Worker Protection Act of 2015, which incorporates “Safe Patient Handling and Mobility (SPHM).” Harwood, whose research on SPHM has been widely published, addressed the benefits patients receive when their health care workers are able to lift and move them without sustaining injuries. Harwood cited research from SPHM program studying a Veterans Association nursing homes that improved bed mobility and transfers; improved urinary continence; provided patients with higher alertness and engagement; and decreased falls risk, and combativeness. While students, residents, and SMHS faculty embraced health policy and its potential to improve patient care, Capitol Hill legislative aides were likewise immersing themselves in the medical school experience to ascertain what problems need solving and how the government can help. At Project Medical Education, a spring event held by SMHS with the Association of American Medical Colleges, congressional staff members trekked to Ross Hall to learn about the fundamentals of medicine. Discussion ranged from medical school to residency to research and touched on subjects like funding, clinical public health, and revamping graduate medical education. It’s the collaboration and communication between Capitol Hill and SMHS that is not only essential for ironing out wrinkles in the conception and implementation of health care per Maslow’s hierarchy, but is also a privilege for those at GW. For Robert Grell, a second-year medical student at SMHS, the draw of GW and its proximity to Capitol Hill materialized at the Bera lunch.